In partnership with Zappos I styled my new Paige jeans and Freebird boots for an evening of exchanging gifts with friends! Shop Freebird Boots + Paige Denim on Zappos! 'Tis the season for gathering together. 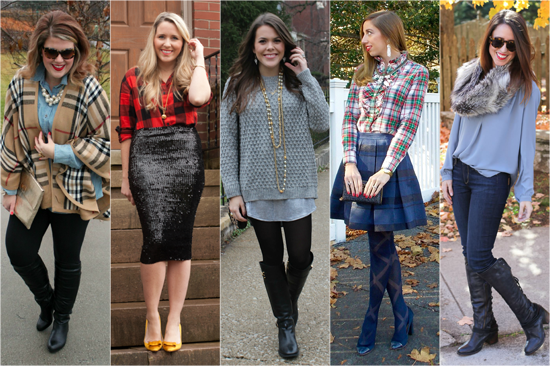 Check out the looks my blogger friends are wearing to their holiday happenings here. And just like that the holidays are HERE! This seriously is the most wonderful time of year! The other 11 months out of the year, we run around with our noses in our own lives, but this month, this spectacular time between Thanksgiving & New Years, we open up our homes to friends, exchange thoughtful gifts, send updates in the mail, & hold our loved ones a little closer. Yes please! That's right people. Zappos is much more than just shoes! This customer service centric company sells shoes, clothing, accessories & MORE! And yes, still living in these Paige denim skinnies & bananas boots from Freebird. These jeans are all about the details - the thick, holds their shape denim, perfectly subdued pocket embellishments, & the fit. Oh the fit! From Paige: "We are completely obsessed with designing pieces you'll live in-jeans that go from morning to moonlight; the perfect pair that works like a charm, always; pieces to help you stand tall in what you're wearing, and take you exactly where you want to go." And I love wearing these shoes out & about, if only for the conversations that they start. EVERYONE asks about these boots. And I smile from ear to ear telling the tale each & every time - Freebird by Steven boots are handcrafted from start to finish, using a traditional "Goodyear construction", in which stacks of leather are hammered together & carefully stitched to create a virtually indestructible sole. This technique has been used to create the highest quality boots for centuries! I've been wearing them again and again for weeks, really putting them to the test, & they are just getting more gorgeous by the day! What pieces in your closet are getting you through the holidays? Check out the rest of my lovely blogger babe's holiday gift exchange outfits here. Fantastic boots and snood, looking great in this outfit! I love that snood- I need to get one for winter! Love this, the fur snood is perfection! 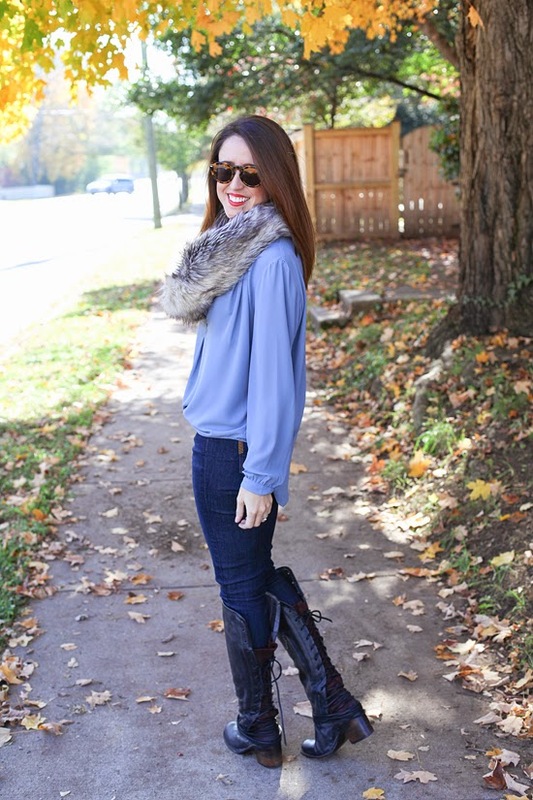 I love how your fur scarf really adds some glam to boots and jeans! The jeans look great on you, and I love the scarf! Your hair color looks gorgeous here! 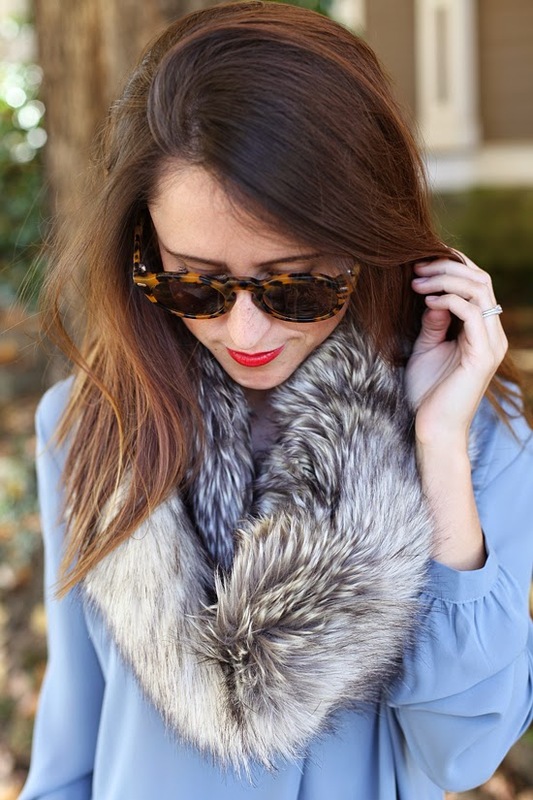 Great pairing with the fur + silky top. Cute outfit! Casual but dressy, love it! I'm love this look! The snood and sunglasses are so cool. The colour of that shirt is also lovely! That snood is lovely. Really changes your outfit. congrats on your partnership with Zappos!! Love this look! love those boots u look stunning! xO!